Over the years, Nigerians, regardless of where they are domiciled, have earned a unique reputation for celebrating events in truly distinct fashion. Apart from gracing such occasions decked in brilliant and eye-catching outfits, the people have stopped at nothing to roll out the drums at such periods, with tasty meals and assorted drinks to complement usually in the line up. The celebration comes in different forms and colour, in fact. However, in recent times, with the advent of the social media occasioned by the rise of information communication technology, the trend appears to have changed, taking new and unimaginable turns by the day. For example, earlier in the week, Nigerian Internet users were stunned by the video and photographs of a young lady washing her hands and feet with bottles of a popular brand of champagne. According to reports, the lady, who was said to have recently graduated from a university in the country, celebrated the feat by popping over 100 bottles of the drink said to cost at least N3, 000 each in the open market. Known with the handle name qualitybeddingnigeria on Instagram, a social networking platform, the lady is said to be from a wealthy home. The video and photographs attracted large views and divergent comments from members of the public. But unbelievable as it sounds, it is not the first time individuals would be adopting ‘bizarre’ measures to celebrate an occasion in Nigeria today. Two weeks ago, photographs of a student of the Nnamdi Azikwe University, Awka, Anambra State, known as Ifeanyi Ubah surfaced online; gripping viewers with shock and surprise. The young man was captured rolling inside mud water and eating bread and bean cake known as akara in local parlance as friends celebrated his graduation from the institution. One of his buddies, Benedict Ejikeme, who wrote a caption along with the photos in a Facebook post, said that the ‘humiliating treatment’ was the best gift they could give him on such momentous occasion. “The joy of university days is complete when you graduate alive, hale and hearty. We went down to celebrate with my own person in the person of Comrade Ifeanyi Ubah, Emeritus President of the Department of Cooperative Economics, Unizik, as he drops his pen today. Congrats brother. We can’t celebrate you any better than this,” he said. Perhaps a more hilarious version of the new trend in celebration among Nigerians played out in North in March 2017 when a die-hard supporter of President Muhammadu Buhari bought and distributed dried spiced meat known as Kilishi in local parlance worth N200, 000 to people to mark the arrival of the Nigerian leader, who had been away on medical vacation in the United Kingdom for 51 days. The excited man, whose name was not mentioned, would have a place in the history books as far as this type of ‘weird’ behaviour is concerned. Two months before that time it was the photograph of a young man named Jibola and his mother being drenched with water by his friends during his graduation ceremony from the university that made the rounds on the Internet. The young man, decked in suit and pants, held tightly to his mother excitedly as the ‘artificial rain’ from his friends came down on them. It was a sight that attracted all sorts of reactions from online users. In November 2016, photographs of three young women rolling in mud water while their friends pelted them with raw eggs and tomatoes emerged online as well. 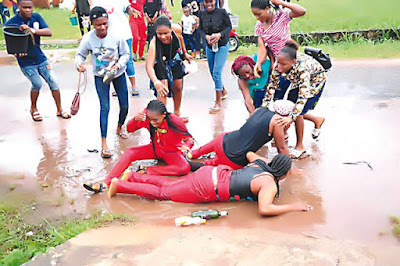 The ladies, like several others, had just graduated from the university and so for them and their friends, it was the best time to enact one of the ‘craziest celebrations’ ever seen. As part of the ‘special treatment’ from their friends, the young women were also drenched with water and forced to roll in it. Not many found the sight amusing. That same month in Benin, Edo State, another sight capable of sending chill down the spine of many played out at a popular night club in the city when images of several young men washing their hands and heads with expensive bottles of champagne hit the Internet. Dubbed ‘showers of blessing’, the act is not just a show of class and wealth by the actors but also a way of warding off poverty, according to their claims. A bottle of the particular drink they ‘wasted’ cost around N18, 000 at the club. The guys were said to have bought around 20 units of the champagne for the ‘bizarre’ celebration. In August 2016, the trend took another twist when a video showing three young men pouring several bottles of expensive champagne on a new car a friend had just bought went viral on the Internet. According to them, they were “washing away bad luck, accident and other evil things”. But amusing and thrilling as these ‘weird’ acts are and or intended to be, some, rather than attracting applause from members of the public and give actors a feeling of satisfaction, have instead ended in tragedy, leaving many scarred for life. For instance, on March 29, 2017, a 14-year-old girl named Victoria Emmanuel was mistakenly bathed with acid by her young friends, who, following in the footsteps of the older ones, wanted to give her one of the most unforgettable birthday celebrations ever. While many of them splashed buckets of water on her, one of them – Moshood Yusuf – a 13-year-old, poured something more dreadful on Emmanuel. In the midst of the excitement, the teenager had stormed into a nearby shop belonging to a woman, grabbed a bottle containing liquid and emptied its content on her. But he miscalculated. What he thought was water or at most alcoholic drink, turned out to be a deadly chemical. The 14-year-old girl, who resides in the Mafoluku area of Oshodi, a Lagos suburb, with her parents, lives with the scars. “I had gone to fetch water at the night market when my friends stopped me on the road and started pouring the water on me to celebrate my birthday,” Emmanuel, who has yet to recover from the burns and shock the incident left her, recalled. “Some were pouring dirty water on me while others poured sand. Then all of a sudden Moshood ran into a shop and brought out a container. There was something inside and I told him not to pour it on me because we didn’t know what was in it. He opened it and said it smelt like chemical. We told him again that he shouldn’t pour it on me but he didn’t listen. As I walked pass him, he poured the content on my body from behind. I screamed and ran towards the tap but he got there before me and opened it so that water would pour on my body. “While I was under the tap, the woman who owned the place chased us away that I was wasting her water. That was the last thing I remembered. I was later told that I fainted and was rushed to the hospital,” she added. Mother to 13-year-old Yusuf, Mrs. Ganiyat, while stating that her son never intended to cause his friend such grave harm, said that the incident was a regrettable mistake which must never be allowed to happen again. “It was just a mistake,” she said. “In fact, Moshood also got burnt by the acid on his chest and leg. He didn’t know the content of the bottle and since they were jubilating, he poured it on her without knowing. “It’s a regrettable mistake. But what we want is for peace to reign. We don’t want a situation where both families would start fighting over it or the two children become enemies,” she added. Another tragic case following this type of ‘bizarre’ tradition of celebration by young Nigerians occurred in August 2016 when a student of the Imo State University named only as Chisom, died after falling into a soak away pit while trying to run from friends, who wanted to pour dirty water on him after sitting for his final exams at the school. Even though the practice is a norm among many students of the institution, the act ended on a sour note on this day. One eyewitness and student of the institution at the time, Chris Darlington Ifesi, confirmed the incident in a Facebook post minutes after the tragedy. “A fresh graduate of the Imo State University took his last breath as students poured him water in jubilation of final year completion. “Everything turned to sorrow some minutes later when he fell into a soak away pit and got drowned in the quest to dodge the dirty water being poured on him by friends. Unfortunately a live wire had fallen into the pit of water he fell into. “Pouring of water has been banned in the school but some students would not obey this. Many people through this unacceptable celebration of final papers have been injured, poured acid and other dangerous liquid sic while some others have died in the process. This must stop,” he wrote. This type of fatality occasioned by ‘weird’ celebration such as this is not peculiar to IMSU, in other tertiary institutions across the country; it is also becoming a popular practice. A graduate of University of Benin, Samson Aigbe, while sharing his experience with Saturday PUNCH earlier in the week, said that he witnessed several tragic incidents during his time at the institution at periods when students engaged in this ‘crazy’ form of celebration. “I remember one time I was admitted at the University of Benin Teaching Hospital, that night a girl was rushed in from the school after she fell and hit her head on the ground while running from friends who were pouring water on her during her birthday. She was in coma at the time she was brought in but survived by the grace of God. “But the next day, another student who had also hit her head on the ground while running from friends trying to pour water on her after completing her final paper was brought in dead. It was a very terrible incident and experience for me,” he said. Disturbing or amusing as the trend seems, it appears to also be gaining momentum in other parts of Africa too. For example, to bid their leader a befitting farewell, members of a group in Uganda known as Rich Gang, poured expensive champagne and splashed money on his grave before burial. The floor of the white and black tiles in the grave was filled with various denominations of Ugandan shillings, South African Rands and United States dollars. In many African, European and Asian countries where Nigerians are domiciled in large number; the practice of individuals emptying bottles of expensive drinks on one another during certain celebration appears to be gaining popularity as well. In Kenya, Ghana, Malaysia and some European countries, sights such as this are now common especially at night clubs and other social gatherings. Sociologist, Boma Douglas, told Saturday PUNCH that the growing trend among many young Nigerians today is as a result of not just the fall in moral values but the inculcation of alien cultures. She said that except concerted efforts are made to re-orientate today’s youths on the need to desist from indulging in such undignifying acts, more young people, thinking it is an acceptable way of doing things, will continue to tow that path, lavishing cash and also putting their lives on the line in the process. “I have been trying to understand the rationale behind this new practice of people pouring water or drinks on themselves while in celebratory mood and I am yet to find a good reason for it because as an individual, I dont know what the benefits are. “People can celebrate anything without unnecessarily engaging in such wasteful ventures such as spending huge amounts to bathe themselves in expensive wines or even endanger their lives by rolling in mud water and being pelted with all sorts of items. “This growing trend merely captures how much our society has crumbled in terms of loss of moral values and dignity for self. Many of these things are alien practices but because we are a people who copy, paste and digest wholeheartedly without editing or sifting to eliminate harmful elements, we find ourselves developing all sorts of funny behaviours. “It’s a pity that the society is not paying enough attention to this type of strange behaviour among the youths. For the younger ones coming up, this would pass a wrong signal to them and further deepen the situation. This is why some form of re-orientation must be done very urgently by relevant government agencies and groups in the country,” she said. Very funny, is that not foolishness?